Twice since introducing it as a luxury convertible in 1939, Ford has suspended production of the Lincoln Continental for extended periods of its own volition. We’re not counting the hiatus in production from 1942-45 brought on by the U.S. entry into World War II, though the first gap in production came shortly after that. The 1948 Lincoln Continental was the last American-made car from a major manufacturer with a V12 engine, and it also was the last Continental off the Lincoln assembly line until 1956. When it was brought back as a Continental Mark II, it carried a nearly $10,000 price tag, making it the most expensive American car on the market that year, equivalent to over $90,000 in today’s dollars. The Continental “spare tire” at the rear’s exterior was a distinctive styling feature. For several decades after that, the Continental was recognized as a top-flight American luxury car and even served as a presidential limousine. Yes, it was a Lincoln Continental, a four-door convertible, that President Kennedy was riding in that tragic day in Dallas. Continentals were even in use when assassination attempts were made on Presidents Ford and Reagan. But Continental sales began to decline as it moved into its ninth generation with the 1995 model and by 1999, numbers had dipped below 30,000. Soon after, Lincoln announced that the 2002 Continental would be the last. What happened? Frankly, I don’t now, but I figure that Lincoln people either had taken for granted their status in the segment or simply run out of ideas to keep the Continental competitive. Quality was an issue, of course. One critic referred to the Continental as a “tarted-up Taurus.” Its appeal was pretty much limited to an older generation perhaps reflecting on the glory days of the car’s past. By the end, the average age of a Lincoln buyer was dead. But fear not! 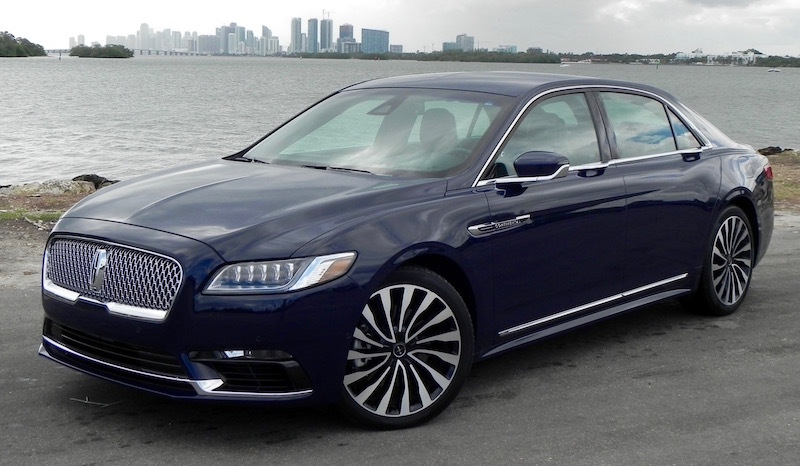 Lincoln showed off a concept of a potential new Continental at the New York Auto Show in 2015, and the positive reception it garnered led to its second (or third, if you’re counting the WWII years) resurrection. 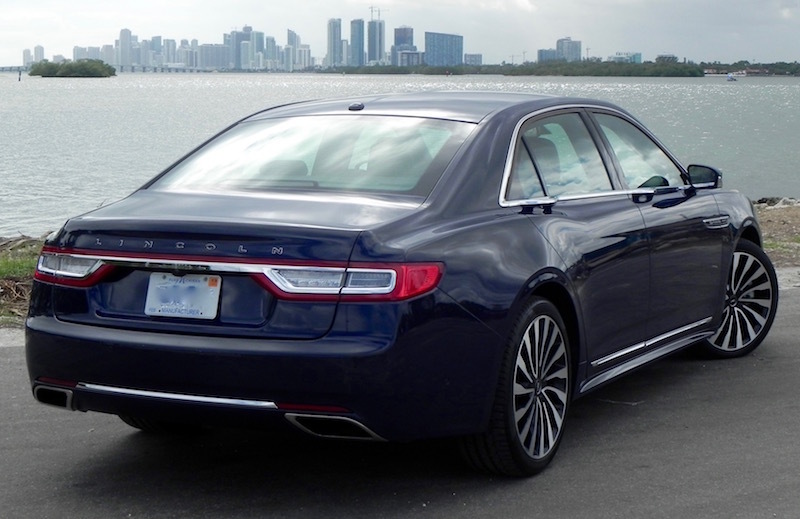 But the 2017 Lincoln Continental is a much different animal from its stodgy predecessor. 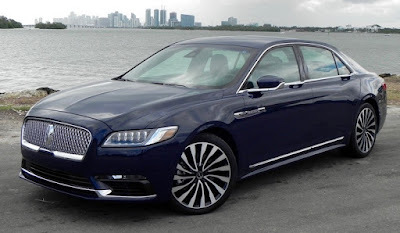 The large luxury sedan field has grown many times since the Continental’s early incarnations, especially with the emergence of imports (speaking of WWII) from Germany and Japan, and the newest Continental doesn’t take a backseat to any in the segment. It has the looks of a luxury car inside and out, delivers a quiet, smooth ride, and, though it may not match the performance of so-called luxury “sport” sedans, has a nice response when the accelerator is punched. The top-of-the-line Black Label edition that served as my test vehicle came with an optional 3.0-liter, twin-turbo V6 engine pumping out 400 horsepower and delivering 400 pound-feet of torque. It is mated to a 6-speed, SelectShift automatic transmission with paddle shifters and a sport mode to enliven the driving experience. All-wheel drive is standard with this engine. Other models get a 3.7L V6 or a 2.7L twin-turbo V6. Estimated fuel mileage for the 3.7L is 17 miles-per-gallon city, 26 highway, and 20 combined and 18/27/21 for the 2.7L turbo, both with front-wheel drive. Those numbers are slightly down about a mile per gallon with all-wheel drive models, and they are 16/19/24 for the 3.0L turbo with its AWD. It would be nice if those numbers were slightly higher, but all the engines run on 87 octane fuel to compensate for that, though 93 is recommended to meet the top performance numbers. 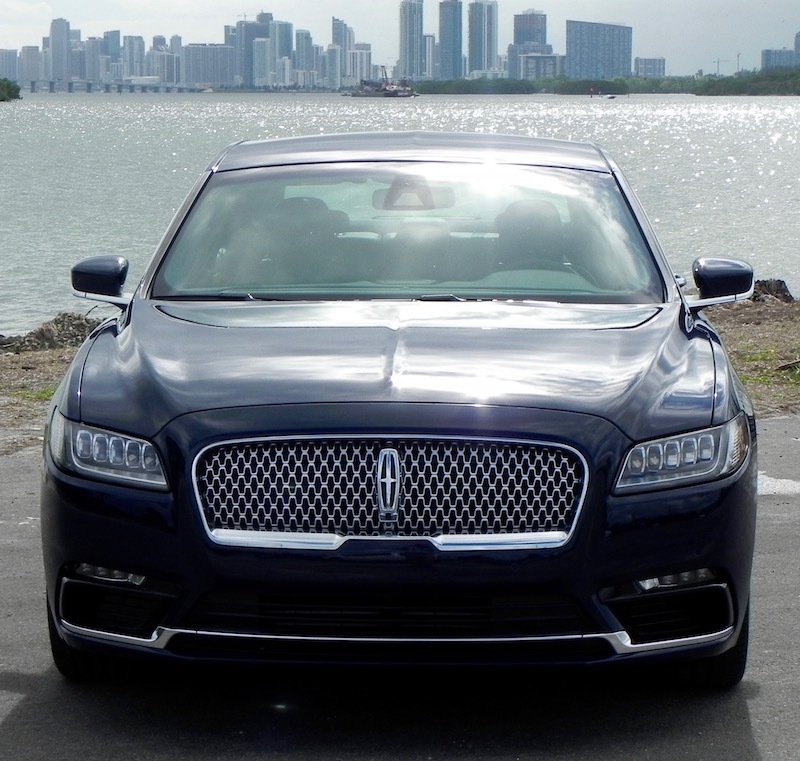 The Continental Black Label’s exterior comes with such standard features as Lincoln’s chrome-mesh grille, HID headlamps with signature LED lighting, LED tail lamps, and a hands-free, foot-activated trunk opener — nice when your arms are full of packages. 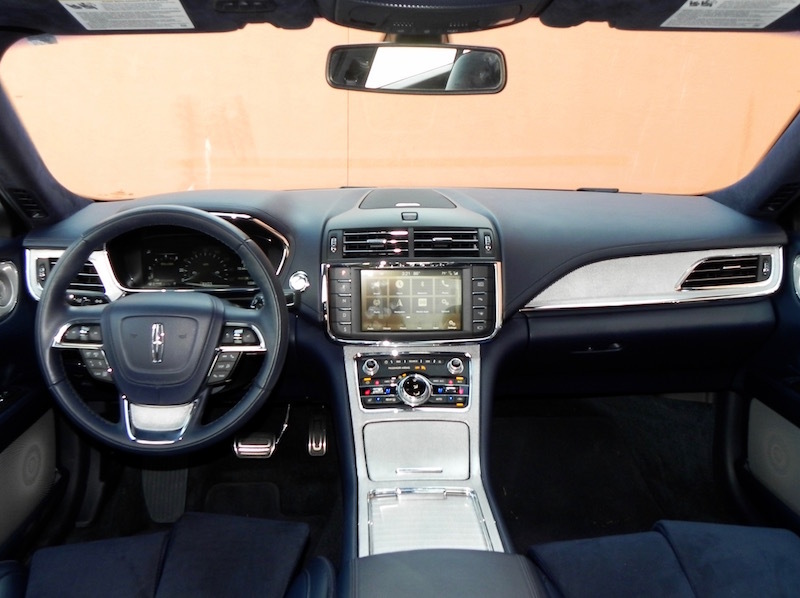 The interior features heated and cooled seats, leather-wood steering wheel, power telescoping steering wheel, tri-zone automatic climate control, Venetian leather trim, heated and cooled seats, and heated steering wheel (of no use at all in South Florida), all standard. Other standard features include a rear-view camera, blind-spot warning, keyless entry and push-button start, a remote start, voice-activated navigation systems, and Ford’s Sync3 system to operate infotainment functions — a really user-friendly system that always gets points with me. All that is included in the base price of $66,000 including destination and delivery charges. Such a low MSRP leaves you plenty of room to add options like a Technology Package that includes parking assist and adaptive cruise control among its functionsm the 3.0L twin-turbo engine, and a Continental Climate Package (heated rear seats, windshield wiper de-icer, and rain-sensing wipers ) that ran the total for my test vehicle to $73,065, still a bargain in a class that has vehicles running into six figures. Extras with the Black Label edition include a 4-year, 50,000-mile maintenance plan, remote new vehicle delivery, remote service pickup and return (20-mile limit), anytime car wash, annual detailing, and a Culinary Collection membership that gives you access to a curated list of exquisite restaurants from coast to coast, including a complimentary dinner for two for new members. 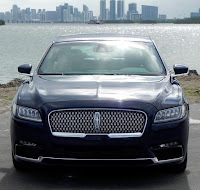 What I liked about the 2017 Lincoln Continental Black Label: The infotainment system is very accommodating for those of us who are technologically challenged, a big bonus in the segment filled with techno wonders. The front offered up to 44.4 inches of legroom, the back an accommodating 41.3. What I didn’t like about the 2017 Lincoln Continental Black Label: The seat bolster on the driver’s side actually got in my way numerous times when I would get in and out of the vehicle. But that may have been an issue with his particular car, or maybe with me. The trunk (16.7 cubic feet) could be bigger. Would I buy the 2017 Lincoln Continental Black Label? Frankly, the base Premier, Select and Reserve trims all may be worth a look. The base starts at just over $45,000 including destination and delivery and with no skimping in quality of materials that makes it an even bigger bargain. But if money was no object, yes, I would definitely buy the Continental Black Label. One can never be sure — there are always grammar nazis around ready to jump on you for the slightest misuse of a term — but I think I have this right. One of the ironies in the automotive world today is that the better manufacturers are making sedans, the fewer the public seems to be interested in buying. If that doesn't fit the exact definition of the term “ironic” or “irony,” please take your complaint elsewhere because that’s not the point here. Just reread the part of the second paragraph that starts with the words “… that the better,” which is the gist of today’s blog. Yes, we are headed into a country where crossovers and SUVs overrun our streets, if we haven’t gotten there already. The family sedan? Not so much. Consider, the latest U.S. sales numbers show that last October seven of the top 10 selling family sedans — Honda Civic and Accord, Toyota Camry and Corolla, Nissan Sentra and Altima, Ford Fusion, Hyundai Elantra, and Chevrolet Malibu and Cruze — all showed declining numbers for the month over the same time period last year. Same thing for year-to-date sales comparing 2017 to 2016. They are down anywhere from 2.3 to 22.6 percent for seven of the top 10. To be fair here, sales of seven of the top-10 selling SUVs were also down for October, but only two of the top 10 were down for the year-to-date. As a segment, passenger car sales were down 600,000 units over the same time a year ago, according to data compiled on the website goodarbadcar.net. Analyzing the reasons for all this is something that is beyond my pay grade. I’m just here to say that, despite the declining sales numbers, it appears to me that the choices in the affordable sedan segment long dominated by the likes of the Toyota Camry and Corolla and Honda’s Civic and Accord are more varied than ever. If you don’t like the Japanese imports, you have many other quality options for sensible, comfortable, and affordable family transportation. I would include the 2017 Volkswagen Passat 1.8T R-Line high in that group. The R-Line is one of four trim lines VW offers on the Passat for 2017. 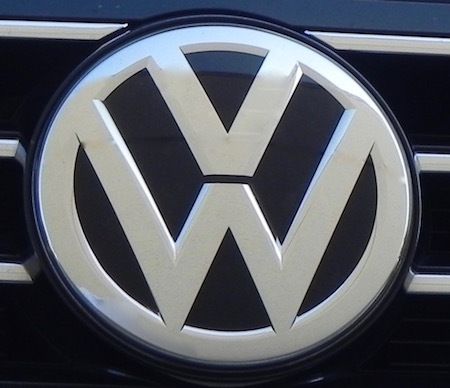 The German manufacturer — though the Passat comes out of the VW assembly plant in Chattanooga, Tennessee — calls it the “most sporting variant” of the group with 19-inch wheels, unique rocker panels and grille, a different front bumper, and chrome-tipped exhaust among distinguishing marks. Other standard equipment includes 8-way power adjustable driver’s seat with lumbar support (manual for the passenger), leatherette seat surfaces, leather-wrapped steering wheel, brake lever, and shift knob, R-line interior trim, Bluetooth phone connectivity, a rearview camera and blindspot monitoring system with rear traffic alert, a six-speaker sound system, and a 6.3-inch touchscreen for the infotainment system. It also features VW’s Intelligent Crash Response System, which in the event of a crash unlocks all the doors in the car (making for quicker access by emergency responders), activates all the interior lights, and disengages the fuel pump (stopping the engine and reducing the risk of fire) and all high-voltage electronics. All that is included in the base MSRP of $24,795 including the $820 destination and delivery charge. That’s a small step up from the $23,260 asking price for the base 1.8T S and well under the $34,715 tag for the top of the line V6 SEL Premium model. Often, an “R” designation on a car model denotes a vehicle with enhanced performance, but that’s not so much the case with the Passat R-Line. Handling is improved, but it comes with a 1.8-liter turbocharged 4-cylinder engine also found in the S, SE, and SEL trips. You can get a V6, which boosts the MSRP up to $30,115 for the SE w/Technology and $34,815 for the SEL Premium. The 1.8T produces 170 horsepower and 184 pound-feet of torque, the V6 280/258, respectively. Mated with a 6-speed automatic transmission, the 1.8T is rated at 23 miles-per-gallon city, 34 highway, and 27 combined, which a bit below average for its class, but the overall driving experience is enhanced when the sport mode setting is engaged, which makes up for that. I just reminded myself that I wasn’t driving a sport sedan and was OK with the 1.8T experience. The interior is a tad short of luxury class, but easy on the eyes. It is functional, comfortable, quiet and also roomy. Front legroom is over 42 inches, rear just over 39. 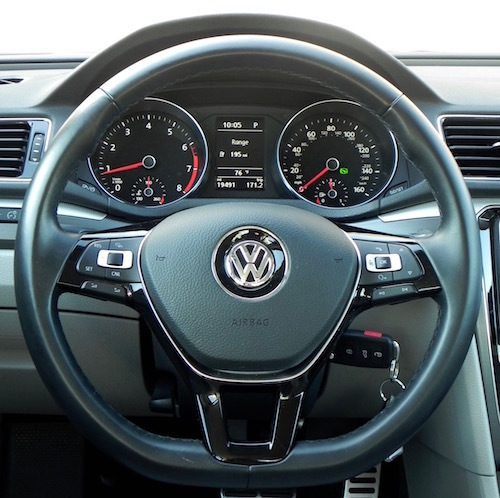 The infotainment system is easy to operate (thank you, VW, for providing knobs to adjust volume and surf the radio dial and knobs for the A/C). The touch screen is on the small side, but my test vehicle did not come with navigation so screen size really wasn’t an issue this time. 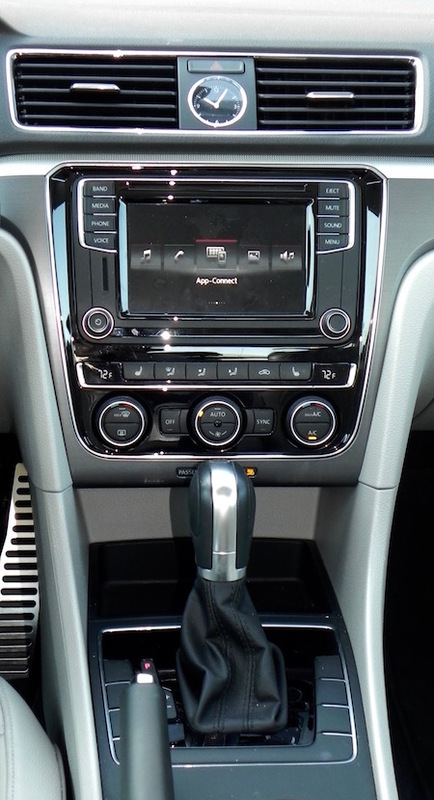 I’m not sure why VW went back to a pull-lever on the console for the parking brake after earlier models, like the 2007 Passat Wagon my wife drives, operated with the push of a button, but that’s not really a deal breaker. Think of it as exercise. 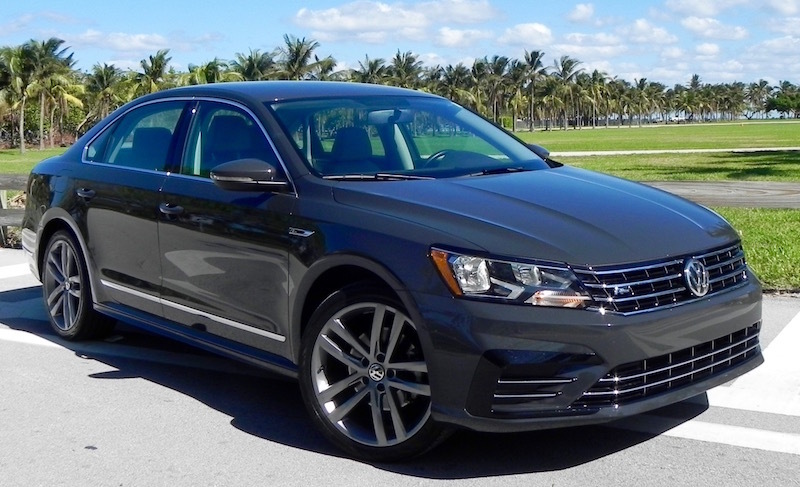 In short, the Passat 1.8T R-Line is a very capable sedan that provides a choice for the buyer who likes to think outside the box. If it doesn’t stand out from its competitors as exceptional, it does everything well and is a solid entrant in a competitive class. 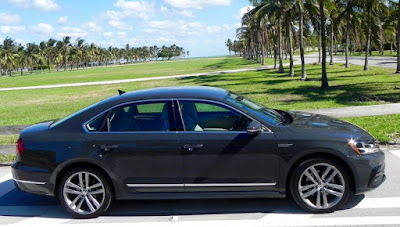 What I liked about the 2017 Volkswagen Passat 1.8T R-Line: The cabin is very roomy, and it also has good trunk space for a midsize (15.9 cubic feet). 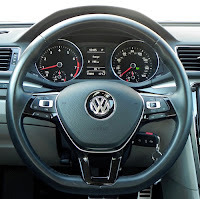 What didn’t like about the 2017 Volkswagen Passat 1.8T R-Line: I’d like a little more kick when it comes to throttle response. 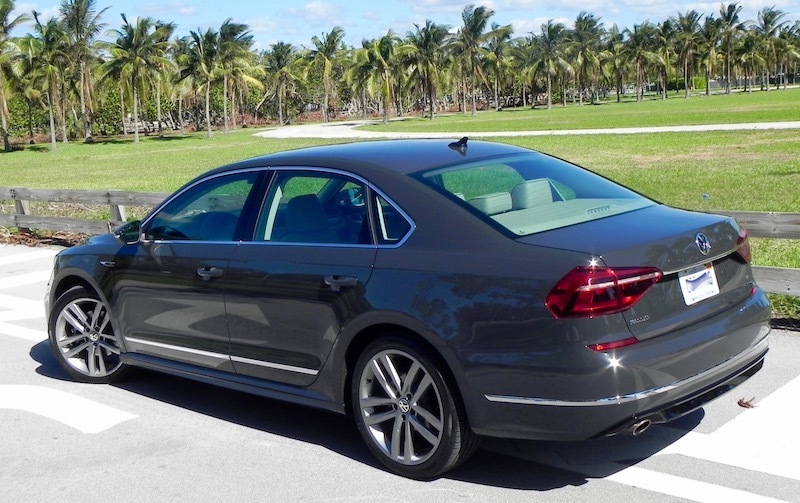 Would I buy the 2017 Volkswagen Passat 1.8T R-Line? Yes. My recommendation may be influenced by the good experience I have had with my wife’s Passat Wagon for nearly a decade, but the new sedan stands solidly on its own as well.